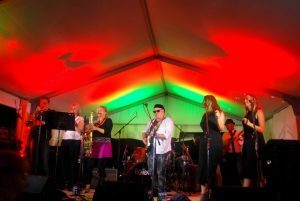 In 2015 The Figmentz performed their Ska / Funk show at Cobargo and in 2017 they brought their Soul Show to the festival . This year will be the best of both with the original lineup of Andy O’Donnell (guitar, vocals), John Drews (Hammond, keys), Ken Vatcher (drums / vocals) and Dave Crowden (bass / vocals) , along with the stunning vocals of Stacey Mills, as well as the fabulous Sapphire Horns Georgi Hargraves (tenor), Helen Gill (trumpet) and Oscar Gill (baritone). Songs by Jimmy Cliff , Aretha Franklin , Otis Redding as well as original Figmentz.